Ogham was sometimes known as the tree alphabet. 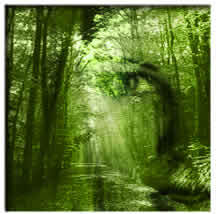 The druids and the celts had a close affinity with nature and trees in particular. Many of the attributes of the trees had a more practical value as well, used to signify bad areas in the country side etc. They were used as a secret code to warn or provide extra information to those who were in the know. Many of the celtic religious ceremonies were carried out in sacred groves with specific trees used to symbolise specific energies and magicks. The trees mentioned here specifically relate to the ogam alphabet and have been split up into the relevant sets to correspond with the alphabet if you are looking for a tree that cant be found here check out the plantlore section.